Want to ski Crested Butte with little ones? Eryn Kaiser shares her secrets. Photo courtesy Eryn Kaiser. 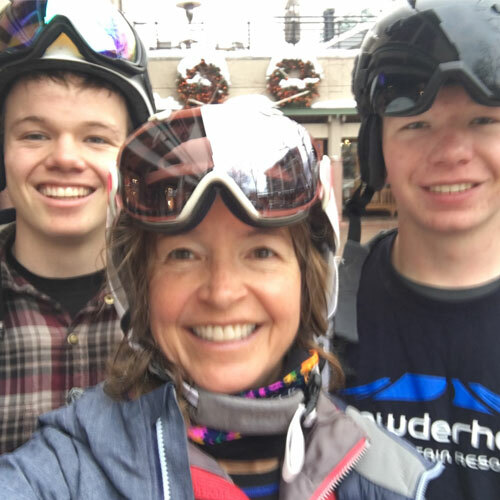 Today, a guest post from Eryn Kaiser, a brave ski mom, passionate educator and outdoor adventure junkie. Eryn’s children are young, so she focuses on skiing with little kids and beginners. Eryn writes about life’s ups and downs at The Gunny Girl. Follow her on Instagram and Twitter. When we moved to Gunnison in 2012, we knew very little about Crested Butte, although we’d heard of its difficult runs and many days of sunshine. Once we moved here, we learned that not only does Crested Butte offer amazing skiing for advanced and expert skiers, it has a lot to offer for young families, too. Eryn and her daughter on some of Crested Butte’s famed Extreme Limits. ‘Cause little rippers soon turn into big rippers. Crested Butte has a high speed lift that serves mostly beginner and intermediate skiers. The Red Lady Express takes skiers to long, groomed and wide beginner runs that are perfect for kids. The Painter Boy lift has a beginner terrain park that is fun even for first timers. The Prospect and Gold Link lifts are also absolutely perfect for families. They have few, if any, crowds and while their runs are rated blue, they tend to be more green-blue. The runs are shorter and perfectly groomed. The views are pretty great too! The Trailhead Children’s Museum is located in the base area. The museum offers a drop off program on Saturdays and Sundays for kids ages 1-6. The fee is $38 for three hours. It gives skiing parents a chance to hit the harder parts of the mountain. Alternatively, if parents are tag-teaming, the children’s museum is a good spot to hang out with your little ones while your partner rips it up. Fun at the Trailhead Children’s Museum in Crested Butte. Photo courtesy Eryn Kaiser. Trackers, next to Camp 4 Coffee is another good spot for tag-team parents. It’s a small bar area that is only open for après ski so during the day, it offers nice comfortable couches and a fireplace. Few people even know it exists so it’s likely you’ll have this corner of the lodge to yourself! New this year, families can get “grab and go” food at Coalbreaker Coffee in the Treasury Building. There are also indoor picnic tables in the Treasury building, if you bring your lunch. If you’re heading to the magic carpets, look for free wagons to help carry your kids and their gear. 1. Pull your kids from school to save money and avoid crowds! Crested Butte offers lots of lodging and lift ticket specials during non-holiday weeks. If you are flying, try to fly into either Gunnison or Montrose. Flying into Gunnison reduces your travel time significantly. Flying into Montrose means only an hour and a half drive to the ski resort. As a single mom with two kids, I think it’s worth it to use these two airports rather than drive to Denver (four hours) and go through security and check in (two hours). 2. Once in Crested Butte, there is a lot to do beyond skiing. The nordic center offers affordable lessons and rentals and some of their trails are free to ski (others require a very reasonably priced day pass). There is also an in-town sledding hill and ice rink. Fat biking is very popular in the valley and Crested Butte just voted to support grooming more miles of fat biking trails. You can also go snowshoeing, snowmobiling, backcountry skiing and take a sleigh ride. 3. If you are coming mid-winter (December-February), pack a lot of layers for your kids. The Gunnison Valley can be extremely cold. It’s common to experience temperatures of -30° F at night. Bring the down coats, hats and mittens. You will need them! Once March arrives, the temperatures rise (and there is more snow!). 4. For families, the Secret Stash Pizza is a hands-down favorite. For a quick lunch, check out Teocalli Tamale (burritos as big as your head). The Sunflower also has great sandwiches and lunches. Priorities at Teocalli Tamale are clear: ski, then eat. Especially on a powder day. 5. As a mom, I say any place that has a kitchen! I always look for a VRBO or AirBnB first. That said, most places in CB are fantastic. And don’t worry about renting a car. Free busses will get you around town and up to the resort. If you are willing to stay down valley, you can find much more affordable lodging in Gunnison, about 35 minutes away. Several hotels in Gunnison also offer ski and stay packages that include lift tickets. 6. Like most mountain towns in Colorado, Crested Butte began as a mining town. It retains its quaint Victorian character and has managed to keep chain stores out. It is walkable and friendly and everywhere you turn, the views are spectacular. Since Crested Butte is not on a major highway and fairly remote (Gunnison County has a population of approximately 10,000), locals work hard and are incredibly appreciative to be here. Speaking of gorgeous views. A favorite Crested Butte shot from the BSM library. February 2011. During the winter, families drive through Gunnison on their way to Crested Butte without considering what the town has to offer. In Gunnison proper, there are several free nordic trails groomed by Gunnison Nordic. The sled hill next to Western Colorado State University is also free. The Jorgensen Ice Rink has three rinks in the winter: an indoor rink, an outdoor covered rink and a pond (the outdoor rink and pond are free). Gunnison Parks and Recreation manages Cranor Hill, a local ski area with a poma lift that is open on weekends and holidays. Cranor costs $8 per child, $12 per adult. It’s a perfect hill if you have kids of varying ages and abilities. My son can do a run or two with me, then hang out at the base while his sister does run after run, finding the bumps and jumps. A common winter weekend for us consists of Saturday skiing at Crested Butte, Sunday skiing at Cranor Hill, then heading over to Waunita Hot Springs for a soak. Weekends (and long lunch hours) are also great for exploring the groomed trails at Hartman Rocks on nordic skis or fat bikes. The trails in Gunnison melt earlier than Crested Butte due to a lower elevation. As you get later in the season, it is entirely possible to spend a morning skiing at Crested Butte and an afternoon riding mountain bikes in Gunnison! Eryn and kids. Photo courtesy Eryn Kaiser. Thank you so much Eryn! It’s great to get your tips for young families…and for all the fun to be had in Gunnison! In addition to these fantastic tips, Eryn passed on these words of wisdom, which all parents need to hear sometimes. As a single mom, it can be exhausting just to get my kids to the mountain, not to mention getting them to ski. I often then have limited time to ski myself. Every now and then, I hire a babysitter to take the kids so I can ski, really ski, too. I need it for my own connection to the sport and to the mountains and I am a better parent for it. It’s important for moms and dads to take time for themselves. Thanks for the reminder Eryn. Crested Butte: Ski. Eat. Drink. Repeat. November 9, 2015. Keep Looking Ahead: Family Biking at Crested Butte’s Evolution Park, September 3, 2015. Crested Butte: Great Family Skiing from Beginner to Extreme, March 10, 2011. Why We ALL Love Skiing at Crested Butte, Colorado, November 30, 2010.